I was pleasantly surprised how popular my Sacramento market recap graphic was last week, so I thought I’d share a Placer County image – especially since I had a few requests for one. The market in Placer County was similar to Sacramento in that it was a year of massive increases where real estate felt like it was on steroids. A Market Facts Download: You can save the image below or click the graphic for a larger file to re-size to your liking (or DOWNLOAD a PDF). Feel free to use the image on your blog, Facebook or wherever. You can link back to me if you wish. By the way, here are two pictures from last Friday’s speaking gig at the Masters Club Roundtables event at Sacramento Association of REALTORS. It was a fun time and so good to see familiar faces and meet new people. I’ll actually be giving the same presentation on Thursday at 11am for the Sacramento Realtist Association meeting. I’m not sure if the meeting is open to the public or not, but I can find out if anyone wants to attend. Here are some of the slides from my presentation. See below or on Slideshare. Question: What stands out to you about the graphic above? Does anything surprise you? Feel free to comment below. If you want to sound smart while talking to clients, friends or playing the real estate category on Jeopardy, this is for you. 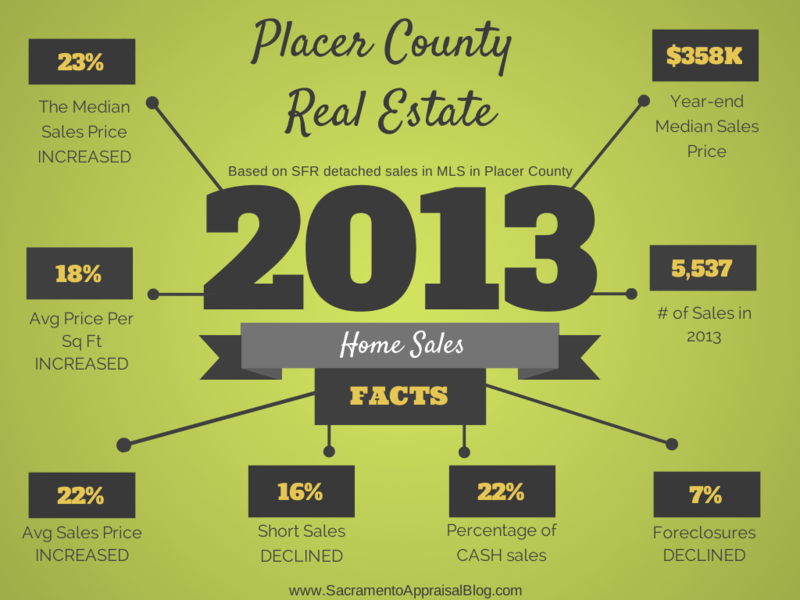 Here are ten quick stats for the real estate market in Sacramento County when considering all of 2013. Enjoy. The median sales price increased by 25% in 2013. Average price per square foot rose 24% this year. Foreclosures decreased by 6.5% in 2013. Short sales declined by almost 18% over the year. Interest rates went up over 1% in 2013. 28% of all sales in 2013 were cash purchases. FHA buyers increased by about 4% in 2013 in the entire county. FHA buyers under $200,000 increased by almost 7.5% in 2013. Cash sales declined by roughly 15% from the beginning of the year. Half of all sales under $200,000 were cash for half the year.